Check one Meta Description per day! You did it a few weeks ago for Meta Titles, now it’s time to do the Meta Descriptions! 1 Bookmark in your calendar to check one Meta Description a day. 2 Open the admin and click on Manage Pages. 3 For each page click on edit, then the SEO button on the editor toolbar. 4 The Description MUST be unique and should be a good description of the page with good use of keywords. Google only reads the first 150 characters (there is a count down next to the Description field). The Meta Description is not as important as the Meta Title. But the cool thing about the Meta Description is how and where it appears. When you do a Google search the links come up on the page with a summary below them. That summary is usually a random part of the page Google has selected. Like many people, I always look at these summaries to see how relevant the link actually is to my search. And I rule out many of the links because the summary just doesn’t look enticing or on target. Here is where the Meta Description comes into play. If Google likes your Meta Description, it will use it to display as the summary. There is the opportunity for you to write these descriptions specifically for each page, like a mini advert. Seeing double – Surefire Design clients with two sites… and why! Why would you choose to have two websites? A growing number of business people are becoming more savy about the power of targeting their marketing, and how more than one website can improve your overall web marketing results. It may sound odd at first, but there are some very good reasons for having more than one site. The fundamental reason is to reach particular target markets. The method is by giving Google (and the other search engines) exactly what they are looking for. The more specific, well optimised content you provide to Google, the higher you will rank in the searches from the people you are trying to reach! Separate sites allow you to really focus on the key words and phrases in the meta titles, meta descriptions and content. And with a Surefire Design no setup fees website, getting a second website can be more effective and cheaper than a Google Adwords campaign on an existing site. (Appologies for the blantant plug, but it’s true!!). Also when people land on the website they are getting a more specific and effective message. Here are some examples from our clients. These are differentiated by geography, target market groups and product categories. Two different geographic targets. People are these days searching with the location in the search string. 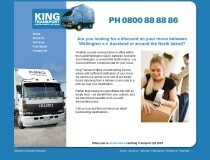 For instance you might type “furniture removal wellington” into Google. This second site targets a specific time frame each year. As tax time comes around certain visitors will search for refund information by the year. Separating different product groups for different markets. High end designer kitchen clients will search differently, and be looking for different information, to customers who want to DIY. Differentiate complimentary product or service. Here a specific product within the business has a site of its own. This allows for much more specific information on the product. Associated businesses. These two business share branding and location. The complimentary sites link into each other. 565 – Justinian the Great deposed Eutychius, Patriarch of Constantinople, after he refused the Byzantine Emperor’s order to adopt the tenets of the Aphthartodocetae, a sect of Monophysites. Think of a topic and you are sure to find something about it in Wikipedia. As much a social phenomenon as anything, Wiki (Hawaiin for quick) is a giant encyclopedia built by the people that use it. Creating an encyclopedia through user submissions doesn’t sound like a great idea, but with a clever system of contribution and peer review on a massive scale it works! For unlimited entertainment also check out at the bottom of the Wikipedia home page – Wikiquote, Wikispecies, Wikinews, Wikibooks, Wikiversity, Wiktionary, Wikisource! Customers love looking at images, so why not reinforce your brand and share your product range with them? Have you been to an expo recently, or done some great onsite work for a customer? This weeks task is simple. 1 Upload some new photos to an existing gallery or create a nice new fresh gallery! Here’s a tip for ordering your images in a gallery. Start from the end. If you load your images from the last spot towards the front spots, your newest ones will always show first online. What is this cloud everyone is talking about? Do I need one too? Has a geeky looking IT person used the word ‘Cloud’ around you recently? It’s not as magical as it sounds! All it means is storing files and documents on the internet instead of your own computer or your company’s network, and/or using computer programs that are also sitting on the internet instead of on your computer. A really good example of this is Google Docs (Google it if you want to know more! ), free word processor, spreadsheet, powerpoint and file storage programs you can use directly on the internet through your web browser. The advantages of using the internet (Cloud) to create and store documents is you don’t have to worry so much about backing them up, and they are accessible even when you are travelling. The downside (particularly in New Zealand) is that when internet access is slowing down or broken entirely, you can’t reach those important docs!